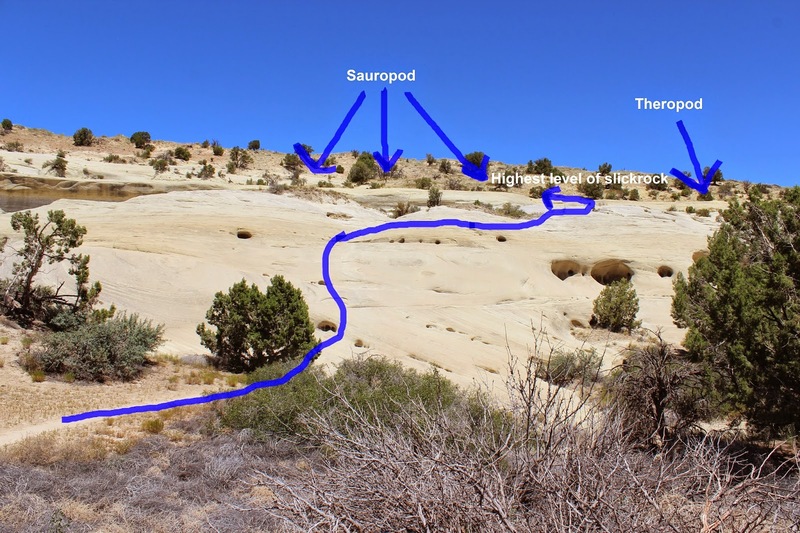 The Twenty Mile Dinosaur Trackway is located in the Hole in the Rock Area of the Grand Staircase-Escalante National Monument near Escalante, Utah. 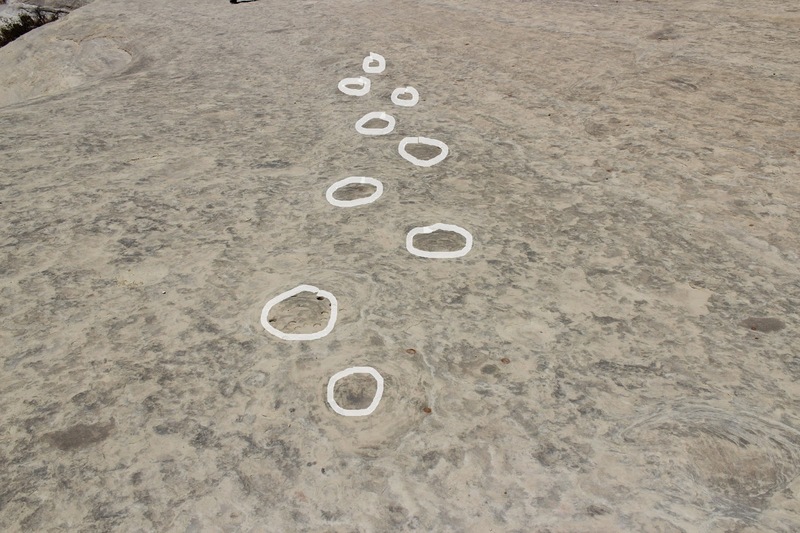 The site consists of over 350 individual dinosaur tracks most of which were made by plant eating sauropods. Also present are a few three-toed or theropod tracks that would have been made by a predator such as an allosaurus. 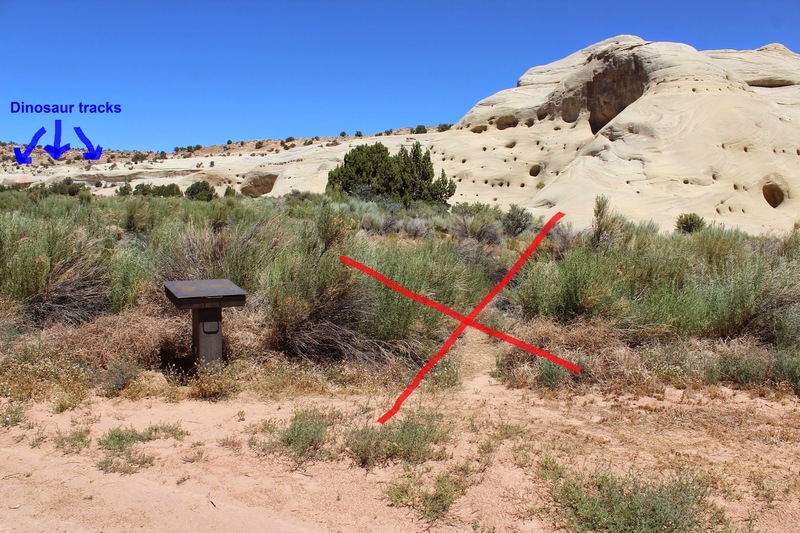 To get to the trailhead begin measuring your distance at the Hole in the Rock turnoff on Highway 12 east of Escalante.. Follow the Hole in the Rock Road for about 14.3 miles. Make a right turn at this point as seen in the above photo. Continue on this dirt road for 2.3 miles and turn right. Stay to the left as you head toward the white sandstone cliffs. After a short distance the road crosses a sandy wash that may be impassible by low clearance vehicles. 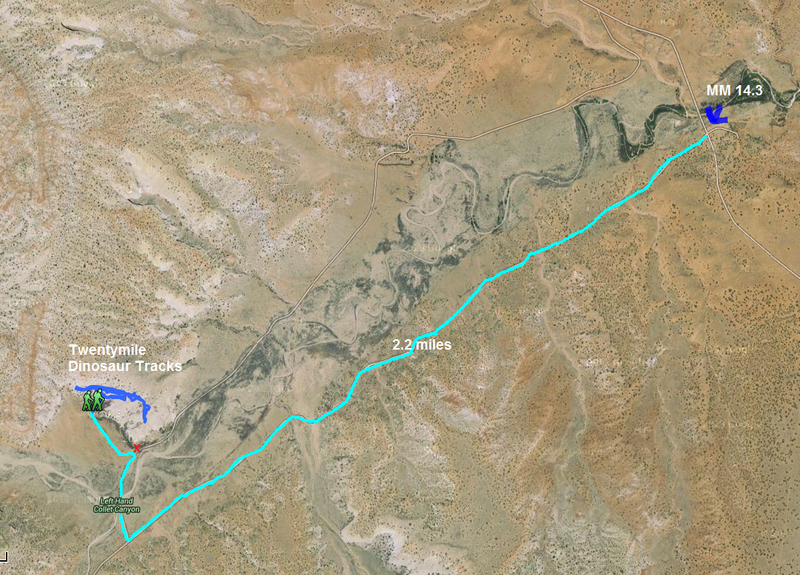 If you park before crossing the wash it is only about another quarter mile to the trailhead. 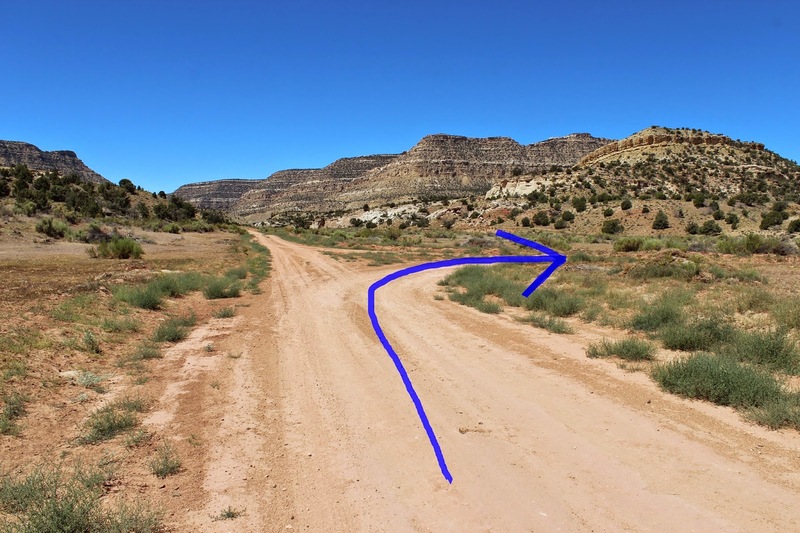 Since this can be a frustrating site to find we have outlined the route between the Hole in the Rock Road and the actual trailhead. The red 'X' marks the 'False' trailhead. This would be a good picture to click on and print out and take when visiting the site. This is the trailhead that the rangers at the GSENM Visitor Center sent us to. There aren't any dinosaur tracks near this point. The sandstone cliff is too steep to safely climb and the trail to the correct trailhead is overgrown with brush. The best way to proceed is to get back in your vehicle and continue a little further along the road. This is the trailhead that you are looking for on the right hand side of the road. The dinosaur tracks are located on the highest level of slickrock. The tracks are very shallow but after your eyes get accustomed to looking at the rock the tracks are easy to pick out. Once you realize what you are looking at you will be amazed at how many tracks there are. Long trackways can be followed that lead right over the edge of the cliff. 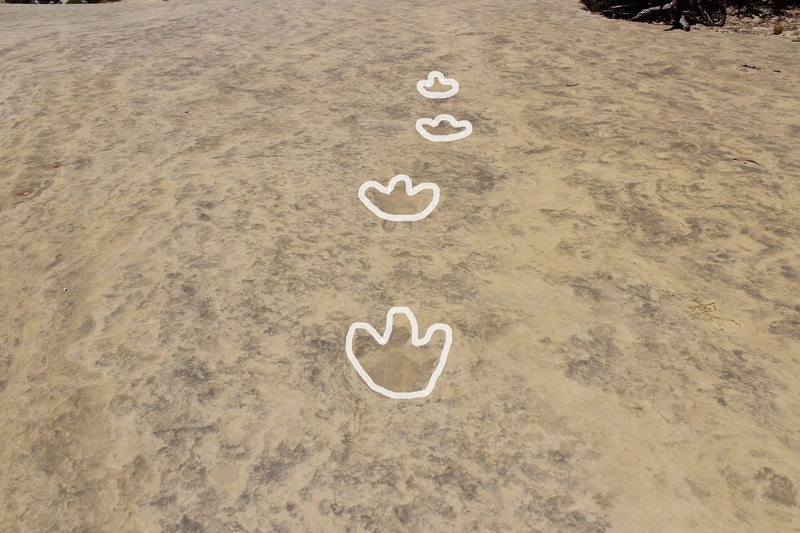 Some theropod tracks can be found just to the east of the sauropods. They are also shallow but once you find one it is easy to find others although there aren't very many of them. The information at the first trailhead says there are more theropod tracks than sauropod but they have it backwards. We go on a lot of hikes where we see herds of bighorn sheep or deer tracks and usually if we look around we will find some mountain lion tracks close by. Since these theropod tracks were left by a predator dinosaur it seems that some things never change. The characters may have changed but the circle of life remains the same. An examination of the cliffs above the 'false trailhead' didn't find any tracks tracks in that area. There are some enjoyable views though. This post goes into more depth describing how to find the site than it does about the site itself. That is because on our visit we ran into people that were lost and confused. One group had driven too far into the canyon and the other had found the correct road but missed the trailhead. The tracks at the Twentymile site aren't very deep and can be hard to see but once you figure out what they look like you will be amazed. Just imagine, over 160 million years ago dinosaurs were roaming right where you are standing. If you would like to see it for yourself then all you have to do is 'Take a hike'.